The sixth fragrance from Rihanna called RiRi was launched late summer in 2015. What is different from the rest of the scents rihanna has launched is the new design of the bottle. The pink bottle with the metal gold head stopper brings a sense of character of luxury and uniqueness that make this bottle stand out not only from the scents previously launched by rihanna but also the bottles in your own collection. RiRi is different to the other scents you might own already from rihanna, so you wont be disappointed by having two differently named scents that smell the same. Mandarin, Cassis, Rum and Passion Fruit. Pink Freesia, Jasmine, Orange Blossom and Honeysuckle. Indonesian Sandalwood, Skin Musk, Siam Benzoin and Vanilla. On first spray you will instantly smell a unique sweetness and fruitiness coming from the passion fruit and mandarin, The hint of rum stop RiRi from running away with itself with that initial fruit blast. The Floral heart which consists of sweet flowers, help bring a softness to this scent which helps this scent become unique in its own way and bring a mature element to stop this scent from smelling like a fruity sugar bomb disaster. The base brings even more maturity adding sophisticated depth with a musky vanilla to transform this scent to compliment any season or occasion. RiRi stays seductively close to the skin but lets you know its still on you, from its comforting aroma throughout the day or night. 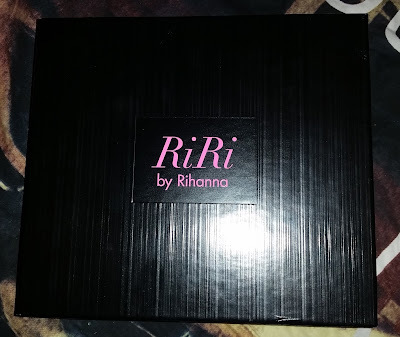 I was lucky enough to get my hands on the RiRi set that arrives in a black lid with gold box. Inside you are greeted by a pink inlay of the box, working with the pink bottle coloured theme. You receive a bath/shower gel and a body lotion that smells just like the Eau de Parfum. What is great about Rihanna's scents are each one is completely different and unique. RiRi does have some resemblements to that typical celebrity scent, but if you like sweet, fruity, vanilla or soft florals all complimenting and working together, than this is one to add to your collection! Hopefully Rogue man will be more available here in the UK, to smell just how great that scent will be.